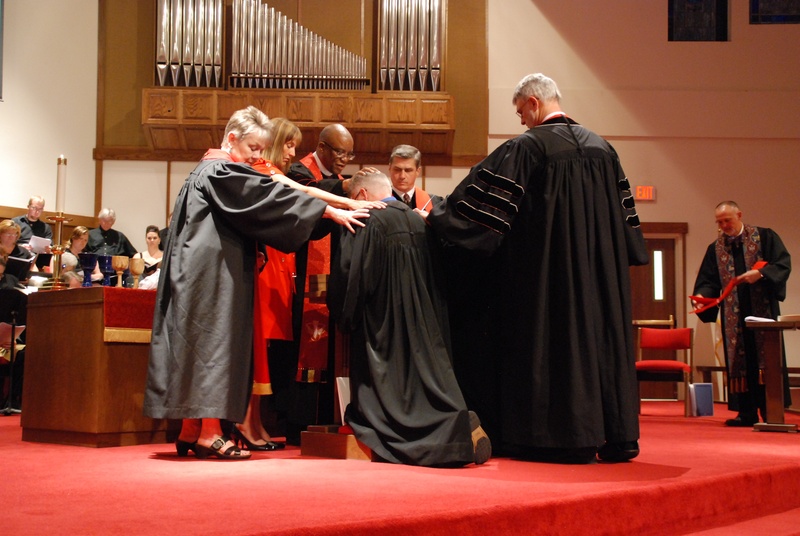 It is nice to look at this picture, because when I was ordained I did not see a thing (at least not physically). I closed my eyes and focused on the moment for which I had studied so hard. All of the years of the journey seemed to come to this moment. I am referring to the moment that the bishop (Bishop Earl Bledsoe) placed his hands on my head and charged me to “Take authority as an elder to preach the Word of God, to administer the Holy Sacraments and to order the life of the Church in the name of the Father, and of the Son, and of the Holy Spirit” (The Sacrament of Holy Orders). I remember two distinct sensations that I had while kneeling with my eyes closed. The first thing I felt was a heightened awareness of so many hands that were placed on my head and shoulder to lead me to this particular moment. I am not just talking about the hands that were physically touching me, but those who helped guide me along my path. It felt like just about everyone I knew was with me and confirming my calling. I knew that friends and relatives who had gone on before me were now with me celebrating in this moment. I knew that I was blessed beyond measure. I also had an extreme awareness of the presence of God as a white light of love appeared to envelope the service. This light was pure and bright with its primary source coming from aboveme. It was an extraordinary second in time that I know will not be repeated again. It confirmed that light that I felt as a child when I would attend church. God’s grace was again revealed in my life as I felt the assurance of being in the right place at exactly the right time. All of these feelings were inside of me during this picture. We sometimes loose our memories of being present in the moment as we continue our journey. Time seems to dull those sensations. I know that there are a few moments in my life that I will never forget the presence of God in my life. They are my wedding, the birth of both of my children and now my ordination. I pray that I may be a blessing to others and that Christ may be reflected in my actions. I hope to empower someone in my own ministry to experience God in ways that leave them speechless and full of wonder. The journey did not stop with this picture, in fact, this is just the beginning. May we all take from this odyssey of life the blessings of God so that we may bless each other! This entry was posted in Uncategorized and tagged Christianity, faith, spirituality. Bookmark the permalink.